Library image #2062: Summit of Diamond Peak looking north to Three Sisters, Mt. Jefferson and Hood. The United States Congress designated the Diamond Peak Wilderness (map) in 1964 and it now has a total of 52,477 acres. All of this wilderness is located in Oregon and is managed by the Forest Service. Great glaciers carved Diamond Peak after volcanic activity created the mountain. Today, at 8,744 feet, it surpasses every other summit in this region of the Cascade Mountains. Diamond Peak Wilderness, which straddles the crest of the Cascades, rests largely beneath a dense forest of mountain hemlock, lodgepole and western pine, and silver, noble, and other true firs. Snowfields remain most of the year in pockets above the tree line, and dozens of small lakes, one to 28 acres in size, bejewel the high country. Pikas and marmots scurry about the numerous scree slopes, along with Roosevelt elk, at least until November snows drive them out. Stinging hordes of mosquitoes hatch from the first of July through much of August. Excluded from Wilderness designation but on the eastern and southern boundaries you'll find three large scenic lakes: Summit, Crescent, and Odell. Approximately 14 miles of the Pacific Crest National Scenic Trail pass through the area and near Diamond Peak itself, and another 38 miles of trails give access to many lovely lakeside campsites. Mountain climbers scaling Diamond Peak's nontechnical summit often set up base camps at Marie Lake, Divide Lake, and Rockpile Lake. Much of this area is worthy of off-trail exploration. 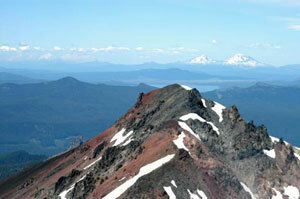 Planning to Visit the Diamond Peak Wilderness? How to follow the seven standard Leave No Trace principles differs in different parts of the country (desert vs. Rocky Mountains). Click on any of the principles listed below to learn more about how they apply in the Diamond Peak Wilderness.